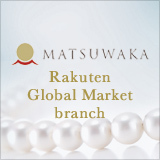 The Glass Beads of Matsuwaka | Matsuwaka Glass and Pearl Works Corporation. The start of Matsuwaka Glass and Pearl Works dates back to 1887, when founder Teizo Wakamatsu first began the production of glass accessories in the land of Izumi. 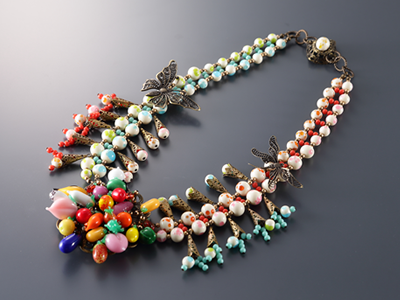 Since the launch of colored glass beads under the name of "Izumi Beads" in 1897, the company has continued to develop and pass on solid skills into the new century. Our products are crafted from two types of soft glass: with and without lead. Each and every bead is meticulously handcrafted by seasoned artisans, who engage their sharp sense and well-honed finger tips to give birth to works of art. No two products are identical and originality lies in every aspect of a product's shape, size, and design. 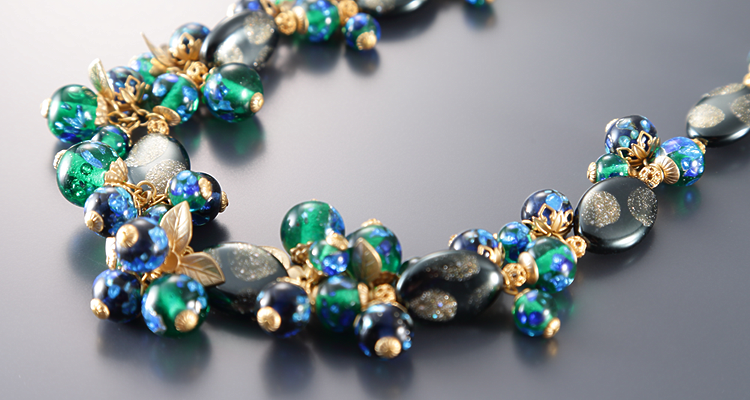 The warm, antique feel that is unique to hand-made products and the iridescent faces are the ingredients of the charm of Matsuwaka glass beads, a significant piece of treasure which embodies the origins of our company. Passed down from parent to child and from child to grandchild, glass crafting has grown together with Izumi City. Today, craftsmen continue to produce masterpieces which reflect their skills that have been refined to the realm of art. Glass crafting in Japan is rooted to the production of colored glass bead by artisan Kiyomatsu Kamiyama in the Meiji Period. The technique, known as lampworking, remains unchanged even today. The meticulous craftsmanship of highly skilled Izumi artisans is not something that can be easily copied. 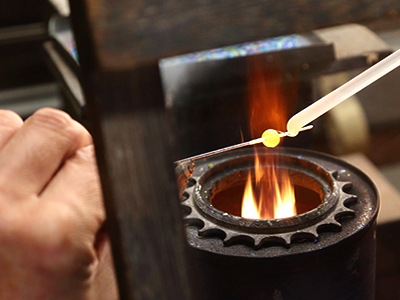 The first step of creating a bead is to melt a glass rod using a burner. Molten glass is dripped onto a steel mandrel, which is slowly rotated so that the glass forms an even sphere with a diameter of 4 to 12 millimeters. During the shaping, foil sheets and glass powders are used to add colors and patterns which give the beads their prismatic charm. Matsuwaka glass beads are products of skill and time. Never rushing for time and always giving whatever expertise and skills it takes, we are able to bring about the warms that is unique to hand-made products. Matsuwaka glass beads come in various shapes and sizes. 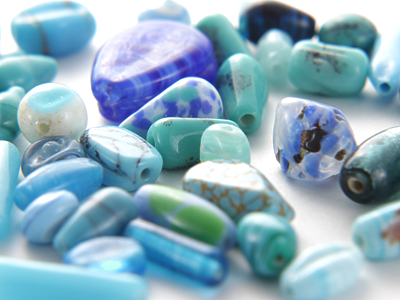 We make a point on having each and every bead embody the creative intent of the maker. The distinguished skills of our craftsmen are evident in the world of beauty presented by products such as the Firefly Glass with extra shine brought about by aluminum foil, Dragonfly Beads or otherwise known as Tombo-dama in Japanese whose delicate patterns create a micro cosmos of their own, and Pearl Glass where glass beads are coated with pearl solution. Designs in which multiple parts are combined with unlimited creativity are also captivating must-sees. Aside from taking orders for parts, we also offer various accessories adorning a balanced combination of multiple parts based on your request and budget. Whether formal or casual, we are particularly experienced in assembling accessories such as necklaces, earrings, bracelets and brooches that adds an air of brilliance to our female customers. Small lot orders and OEMs for branding purposes are also welcomed. Please do not hesitate to consult us about any needs.